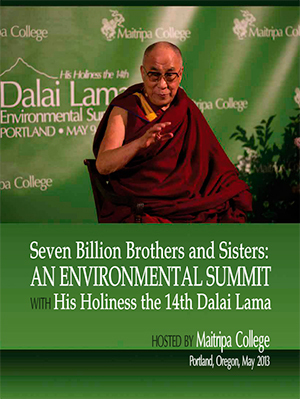 In May of 2013, Maitripa College hosted a 3-day Environmental Summit in Portland with His Holiness the Dalai Lama, joined by spiritual, environmental, and political leaders from the Pacific Northwest. This video was created in celebration of the event. Click on the e-book cover on the right for an on-line experience of all activities over the 3-day summit, including dazzling photos, quotes, and advice from His Holiness and participants. This school is a non-profit corporation and is authorized by the State of Oregon to offer and confer the academic degrees and certificates described herein, following a determination that state academic standards will be satisfied under OAR 583-030. Inquiries concerning the standards or school compliance may be directed to the Office of Degree Authorization, Higher Education Coordinating Commission, 255 Court Street NE, Salem, Oregon 97301. Mission Statement: Maitripa College is a Buddhist institution of higher education offering contemplative learning culminating in graduate degrees. Founded upon three pillars of scholarship, meditation, and service, Maitripa College curriculum combines Western academic and Tibetan Buddhist disciplines. Through the development of wisdom and compassion, graduates are empowered with a sense of responsibility to work joyfully for the wellbeing of others. We serve our students and the region through diverse and relevant educational, religious, and community programs.